Jonathan Rea is only two wins short of Carl Fogarty's record of 59 World Superbike victories. World Superbike champion Jonathan Rea will have his first chance of equalling Carl Fogarty’s record of 59 career wins this weekend at Imola in Italy. 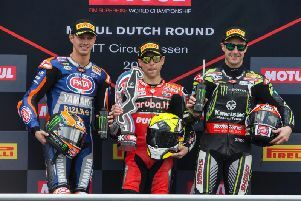 Rea requires two more victories to draw level with Foggy and has enjoyed plenty of success at the Italian circuit in the past, claiming doubles in 2014 and 2015. The Kawasaki rider, who leads the championship by 30 points going into the fifth round, said: “It’s been good to be at home and recharge the batteries after our recent back to back races, and then a test in Brno. “I’m feeling good ahead of the Imola weekend. It’s a track that has a fun and challenging layout. It’s also been a circuit where we have just lacked that last piece of the jigsaw in recent years so it would be great to try to improve on our most recent Imola form. Race one is scheduled for 12:00 BST on Saturday, with the second race at the same time on Sunday.